A few months back, James called me to tell me that our students' parents were very concerned about our uniforms at the NHA School. The original NHA Kabala School Uniforms. As adorable as they were, they were not practical and were causing some problems to the families. James and Kadijah tye-dying the original NHA Kabala School Uniforms. The tye-dye was a unique and cute idea, but not wash and wear. The uniforms required ironing and at every laundry the uniforms bled more and more. When the students sweated, the dye ran. In washing, the dye ran. The uniforms quickly became tattered, faded and not up to the standards of our school. Because NHA provides the uniforms at no expense to the parents, being dressed neat and properly is one of the requirements. The children have been wearing them now for a few year. Considering the expense of our upcoming mission trip to Sierra Leone, the worm medication and other needs, I explained to James that at this time, there is nothing we can do. It is difficult to collect for the trip right now, "there is no way to raise money for uniforms, too." This I said a few months ago. James went to Kadijah and voiced his concern over the uniforms. He knows well the struggles NHA has in making our monthly budget, let alone additional needs such as uniforms. Kadijah and James discussed it and decided that they would cut back on their expenses (which are bare bones to begin with) by fasting and eating less, cutting corners wherever they found a corner to cut. And James began taking on more and more photography jobs as Kadijah filled in on the humanitarian aid distribution while James was working. James was lucky. It is not easy to make money as a photographer. Most people have little to pay you and those that have money can be stingy and pay you very little. So James simply took on an overload of work. Timing was perfect, he was able to raise a little money, enough to buy the material for the uniforms. They did all of this without telling me. They knew that I would insist that they must eat properly so that they are fit to do the work - Work that demands very much out of them, including the risks of being around disease. To my surprise I find the following photographs in my inbox. I ask James "where did you get the money?" ...and then he confessed. I have expressed to many of you that I have been concerned that James looks thinner and I have been worried. This noble sacrifice for the students is so typical of the Mansaray family! I am very appreciative, but I am publicly announcing to James "Eat, son EAT!" The uniforms are done, you did well. NOW take care of yourself and your family. 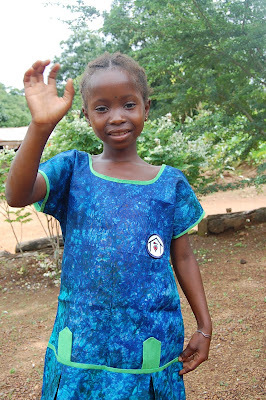 Without you guys, Nazareth House has no one to be there in the midst of the poorest of the poor in Sierra Leone. Seeing the sacrifices of James and his family, they literally gave up food and everything to provide for those without. By American standards, James and Kadijah are themselves, way below poverty level. What they have done for the students of Kabala is indeed remarkable. I hope this extreme sacrifice will not go in vain, I hope it stimulates those of us who have so much more to give to those with so little. 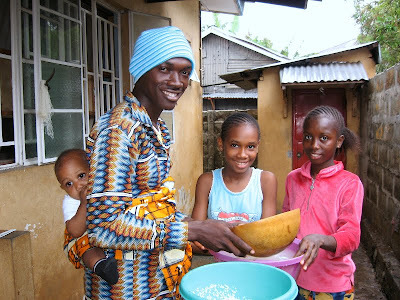 We don't have to give up meals and take on extra jobs (although it wouldn't be the end of us if we did) like the Mansaray's did, but we can scrape a few extra dollars and send it to NHA so that we might at least provide one meal for someone who has none. click the link above to give electronically through our website. Congratulations to the Bangura Family, a child is born! Last year the October 12th post on this blog read: "Sad news, another child lost...". 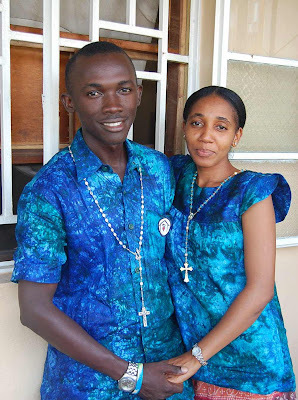 Salu and Kadiatu had experience yet another loss of a child. A few short years before, they lost Isha, their oldest daughter. Then last year they lost their daughter in the womb because a c-section wasn't performed in time. A year later, Nazareth House is ecstatically happy to announce the successful birth of BABY GIRL Bangura. Praise be to God! What a beautiful event and the smile on the proud mama's face says it all. Well done, Kadiatu, Congratulations. We love you! James and Kadijah went immediately to the hospital. Kadijah happily tending to the baby as Kadiatu recovers from labor. Big Sister, Salma has been praying so hard for baby to arrive alright! It is so wonderful to see Salu and the whole family smiling on this joyous day. On behalf of Salu, Kadiatu, Salma and baby Bangura - as well as all of us at Nazareth House Apostolate, thank you for your prayers. Thanks be to God. 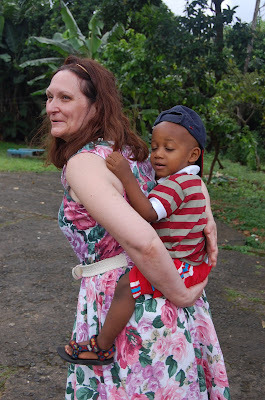 Remember a few blog posts past, when Roo, in the above photo, showed us the supplies that he and his dad, James, bought for our school in Kabala? All of those items have now been successfully delivered. James and Kadijah with the whole St. Laurence Family from Freetown journeyed to Kabala last weekend to deliver the school supplies. They were received by Mako, Pastor Foday and the teachers. Roo is extremely excited to be able to present the gifts. Kadijah helps sort the items out on the table. We are very grateful to James and Kadijah and the whole family for tirelessly doing the work of Nazareth House. It is one thing for us to raise the money, get supplies and get it to James. Its another story once it leaves our hands. 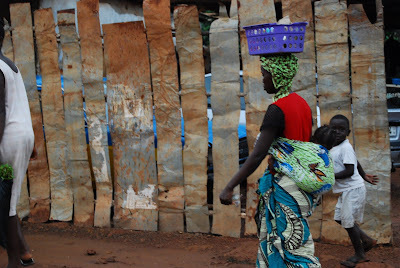 After it arrives in Freetown, this family does all the work. Buying the rice, the supplies, paying the medical fees, paying the school fees, tending to the sick, traveling on the regular trips to bring the the needs and supplies from Freetown to Kabala (a long tedious journey), distributing rice and needs to the villagers along the way, plus all the other work they do daily for us. You work very hard Mansaray Family and NHA appreciates it very much. Thank you. Nazareth House loves you all! Thank you for making it possible for Nazareth House Apostolate to provide for this family and so many others this month ! We really need your help to do it again next month and every month... Presently, we are working hard to raise funds for our on the ground mission which is about to take place. We rely on God as he expresses himself through your prayers, compassion and generosity. Listen to your heart, please consider giving today. woman with amputated hands waits for rice with empty begging bowl. It is always said “seeing is believing ...”so I guess this outdoor display of beggars will convince all of you deniers on the fact that thousands still can’t make a day’s meal here in Mama Salone. This time round, it was right at the heart of the Capital, down town Wilberforce Street, adjacent the famous Central Mosque where hundreds of beggars await the final whistle of the 2:00 PM prayers. For them, it’s payday time as Friday’s are the legal begging days here especially around Mosques where our Muslim brothers and sisters are seen giving out their last pennies to those desperately in need and with the month of Ramadan closing in, the crowd of beggars increases making it very difficult for those who want to give out a little help. Mama Vicki and I had faced such tension and fight when we stop there to buy few religious items and to give help to some of the poor beggars who are always there. The fact is, being hungry and desperate has become part and parcel of these people so do not be surprise to see them fighting over a bowl of rice or even a piece of bread. I called it ‘Survival of the strong’ meaning if you are not strong enough,you get nothing at the end. My pity goes for the aged, the limbless, more especially those in wheel chairs and to crown it all the blind to name but a few who can’t meet what it takes to fight hard for a piece of this lion’s share. I was shocked to witness such a scene and i just can’t afford to keep it to myself but to share it with you in words and in pictures. Seeing old mammies being knock off on the other side by the fortunate young ones sent me on tears, their bowls still empty waiting for a helping hand. Kids who can’t fight hard do nothing but gather from the bits and pieces dropping off on the floor and gutters. Those in wheel chairs wait and see what their kids will get from this turbulent share of just a 50kg bag of rice which is actually meant for a single family now for a whole crowd. At the end most of them goes home empty handed and sleeping hungry. her dignity and smile on her face. You can change someone's life, even if only one life, it is a blessing on you and that life. Nazareth House is approaching yet another mission, another moment to make a real difference in these lives. Please give today, the clock is ticking away - we need your help now. There is a lot to be said about keeping your baby close. "Wearing" your child has tremendous value to it - both for the mother and baby (emotionally and physically). Other cultures have never had to buy bigger and better strollers. 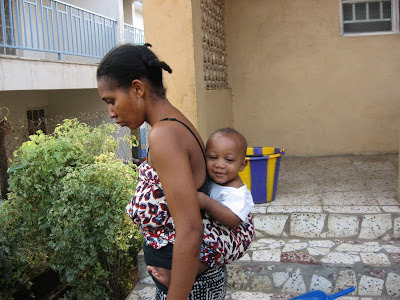 A piece of cloth and you have a baby carrier that serves all purposes. 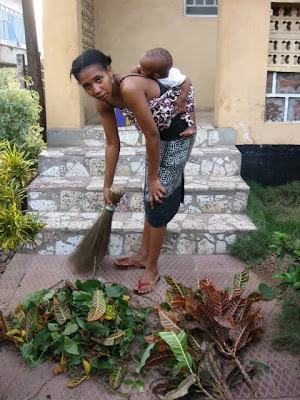 There is no need to wait for the opportunity when baby is asleep to perform your household chores. Strap the child on and go about your work. In the picture below, Roo gets a birds' eye view of the reality of chores. He learns that it is a natural part of life and by being on Kadijah he also becomes a part of it. He is not separated from chores "until he gets older" he is involved in it now. What a great learning tool. Sometimes, mommy needs some time of her own, and daddy needs to help around the house. Baby need not interfere. James in Sierra Leone certainly is secure in his manhood to fling Roo on his back and get busy. You do what can do to make sure the household is running smoothly. Our little Roo finds it easy to carry his toy friends around. How ironic Roo is carrying Kanga in a pouch! 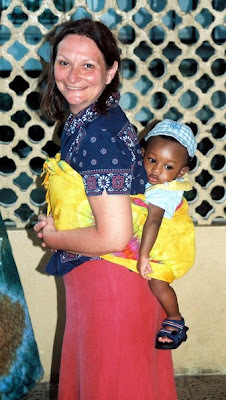 After learning to carry a baby on my back in Freetown. I brought this way home with me to America and my grandchildren became quickly accustomed to being quite close to me. If you've never carried your child, front packed or back packed, I recommend it. The worms are "under pressure"